5Nuclear Medicine Department, Hospital Clínico San Carlos, Universidad Complutense, Madrid, Spain. Institution where the study was performed: Fundación Jiménez Díaz, Madrid, Spain. 99mTc hexakis-2-methoxyisobutyl-isonitrile (99mTc-MIBI) has been seldom used as a skeletal muscle tracer, and exercise changesof radionuclide uptake in different muscle groups have not been explored. The image pattern of 99mTc-MIBI uptake in the lower extremitieswas studied in 15 subjects (14 men, one woman; mean age: 59.9 Â± 12.6 years) with no evidence of muscle or peripheral vascular disease,both at rest and during treadmill exercise. Several muscles could be identified in the scanned regions. No association was found betweenthe intensity of uptake and some cardiovascular and metabolic parameters, but as a whole exercise increased radionuclide uptake in thecalves. 99mTc-MIBI scintigraphic imaging might be a useful technique to assess the functional anatomy of lower limb muscles. 99mTc hexakis-2-methoxyisobutyl isonitrile (99mTc-MIBI) is a radiopharmaceutical which has been widely used for in vivo imaging of myocardial perfusion [1,2] and, less frequently, for evaluation of tumor processes[3,4]. 99mTc-MIBI is a lipophilic cation that behaves like Na+ and uses the Na+/H+ antiport system to enter the heart cell . It eventually goes through the outer and inner membranes of mitochondria, and accumulates into the mitochondrial matrix  by a mechanism that largely depends on the transmembrane potential . As might be expected, this radiotracer settles not only in the myocardium, but also in skeletal muscles. A few studies have investigated the potential role of skeletal muscle imaging with 99mTc-MIBI in the assessment of peripheral vascular disease [8-13], compartment syndrome , uremic  and statin induced  myopathies, systemic sclerosis , Duchenne muscular dystrophy , and the paralytic phase of thyrotoxic periodic paralysis . Muscular response to propionyl- L-carnitine  and neuromuscular electrical stimulation  has also been explored with this imaging technique. However, no one of these studies has focused on the muscular response to exercise and the feasibility to depict muscular anatomy. Besides, technical limitations of former devices -i.e. insufficient spatial resolution- might have restricted the use of 99mTc-MIBI as a skeletal muscle tracer. In the present study, we test: 1) whether muscular morphological data can be obtained from 99mTc-MIBI scintigraphic images, and 2) the association between 99mc-MIBI muscular uptake and some physiological parameters obtained during exercise. Fifteen patients (14 men, one woman; mean age: 59.9 ± 12.6 years, range: 26 to 77 years) were included. They had been sent to the nuclear medicine department for myocardial single photon emission computed tomographic (SPECT) study with 99mTc- MIBI in order to discard ischemic heart disease. None of the subjects had any complaints referred to the lower extremities. Specifically, they did not show any clinical evidence of either peripheral vascular disease or muscle disease. Those patients who had any systemic disease that could affect muscular metabolism, such as diabetes mellitus, were excluded. Subclinical or masked effects of cardiovascular disease in the lower extremities could not be ruled out, but they would have not changed the validity of our study as for the established purposes. The study protocol was approved by the local ethical committee, and written informed consent was given by all the patients. Radiopharmaceutical and imaging protocol. Each patient underwent a two days protocol for scintigraphic study of ischemic heart disease. The details can be found elsewhere . Briefly, conventional rest and post stress (treadmill exercise) SPECT studies were acquired after an intravenous administration of 740-925 MBq of 99mTc-MIBI (Cardiolite®, Bristol- Myers Pharma, Brussels, Belgium) prepared according to the manufacturer’s instructions. Ten minutes after conventional myocardial tomographic studies, planar images were obtained from the lower extremities with a dual head whole-body gamma camera (DST-Xli, Sopha Medical Vision International, Buc, France) equipped with a low-energy high-resolution collimator. Anterior and posterior images of thighs and calves were obtained for 5 minutes in 256 x 256 pixel matrices, with the pixel width being 2.1 mm. Close to the surface of the patient, theoretical intrinsic spatial resolution (RI) was 3.5 mm and collimator spatial resolution (RC) was 2.5 mm. Overall system resolution (RS) is given by the formula . and it equals 4.3 mm. Visual evaluation was performed comparing scintigraphic images with corresponding pictures on a standard atlas of human anatomy , and muscles were depicted according to them. Images were evaluated by both a neurologist (MLC) and a specialist in nuclear medicine (JAA), and a consensus on anatomical correspondence was reached. To assess muscular activity, rectangular regions of interest that comprised the whole thigh over the anterior view and the whole calf over the posterior view were drawn on each side. Mean counts per pixel within the selected regions were calculated. Since no significant difference was found between right and left activities, data for further analysis were derived from the average of right and left values. Knee areas without muscular tissue were taken as control, and results were expressed semiquantitatively as the percentage of uptake with respect to the uptake in the knees. Body weight and height of all the patients were registered at the time of assessment. In addition, maximum systolic blood pressure, maximum heart rate, and oxygen comsumption as the metabolic equivalent of the task (MET) were measured during exercise. For each region of interest, values of uptake at rest and exercise were compared making use of the one-tailed paired Student’s t-test. Correlation between variables was analyzed by means of the Pearson coefficient. Though superimposed muscles contributed to planar images, the following individual muscles and/or muscular groups could be identified in all the patients: 1) in the thighs (Fig. 1), adductors, sartorius, quadriceps femoris, glutaeus maximus, semitendinosus, semimembranosus, and biceps femoris, and 2) in the calves (Fig. 2), tibialis anterior, and triceps surae, with the two heads of gastrocnemius and the belly of soleus being recognizable. Figure 1. 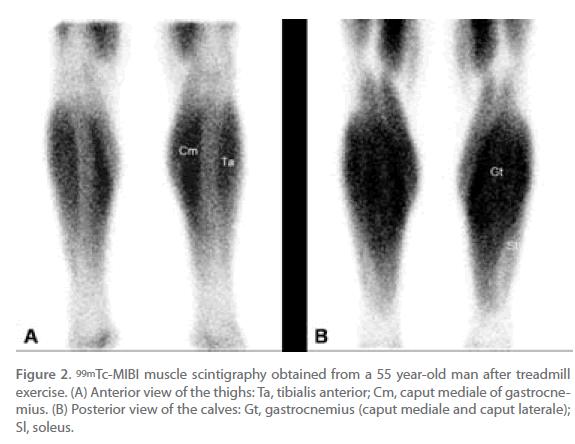 99mTc-MIBI muscle scintigraphy obtained from a 55 year-old man after treadmill exercise. (A) Anterior view of the thighs: Pt+Ad, pectineus and adductors (superimposed); Sr, sartorius; Qf, quadriceps femoris. (B) Posterior view of the thighs: Gm, glutaeus maximus; Am+St, adductor magnus and semitendinosus (superimposed); Sm, semimembranosus; Bf, biceps femoris; Vl, vastus lateralis of quadriceps femoris. Figure 2. 99mTc-MIBI muscle scintigraphy obtained from a 55 year-old man after treadmill exercise. (A) Anterior view of the thighs: Ta, tibialis anterior; Cm, caput mediale of gastrocnemius. (B) Posterior view of the calves: Gt, gastrocnemius (caput mediale and caput laterale); Sl, soleus. From a qualitative point of view, the muscles were more visibly depicted after exercise, specially in the calves. From a quantitative point of view, muscle exercise significantly increased 99mTc-sestamibi uptake with respect to rest uptake in the calves (210.3 % vs. 185.2 %, p<0.01), but not in the thighs (265.8 % vs. 267.8 %, n.s.). Otherwise, no correlation was found between the intensity of uptake and any of the clinical measurements that were taken during exercise testing. 99mTc-MIBI is generally used to evaluate myocardial perfusion or tumor activity, but it has also proved to be an adequate tracer for skeletal muscle. Some technical limitations might have restricted the use of 99mTc-MIBI muscle scintigraphy with former devices, but current equipment has allowed us to get rather sharp images of skeletal muscles. Moreover, 99mTc-MIBI muscle imaging could be further improved by increasing the time of acquisition of planar images or by getting tomographic images with SPECT. We have made use of 99mTc-MIBI muscle scintigraphy in a group of patients who were free of muscle disease. In this setting, 99mTc-MIBI has provided us with anatomical information, as major muscle groups and even some individual muscles could be located on scintigraphic images. In addition, it has given some functional information, as there was a qualitative and quantitative change of 99mTc-MIBI uptake during exercise. The muscles that showed a significant increase of uptake were those most implicated in walking and running, i.e. the muscles of the calves . Presumably the effects of muscle activity on 99mTc-MIBI uptake would have been different with another type of exercise. On the other hand, even with running the analysis of smaller regions of interest restricted to individual muscles might have shown an increase of uptake in additional locations. To date, muscle imaging with 99mTc-MIBI has focused mainly on the vascular properties of this tracer [8-13], but only marginal attention has been paid to the possibility of tracing muscular disorders [17-19]. Furthermore, the effect of muscle activity on 99mTc-MIBI scintigraphy has not been thoroughly investigated for clinical purposes. Due to the pharmacokinetical properties of 99mTc-MIBI, this technique might be particularly suitable for the assessment of mitochondrial diseases. In fact, a cardiac decrease of 99mTc-MIBI-uptake has already been demonstrated when the heart is involved in some mitochondrial gene abnormalities [26-28]. It would be worth exploring any potential applications of rest and exercise 99mTc-MIBI imaging in the evaluation of different myopathies. 99mTc-MIBI scintigraphic imaging might be a useful technique to assess the functional anatomy of skeletal muscles in both health and disease conditions. Undoubtedly, this technique cannot compete with positron emission tomography (PET) as the gold standard in metabolic imaging [29-33]. However, it offers some advantages over PET: 1) the procedure is more simple; 2) it has much lower cost, and 3) it provides different metabolic information, since 99mTc-MIBI is a mitochondrial tracer and does not follow the route of 18F-fluoro-deoxy-glucose, i.e. the usual tracer in PET. 99mTc-MIBI scintigraphic imaging is a simple procedure that provides both anatomical and functional information about skeletal muscles. Further research is needed to ascertain any potential clinical applications of 99mTc-MIBI for tracing muscular disorders. Verani MS. Thallium-201 and technetium-99m perfusion agents: where we are in 1992. In: Zaret BL, Beller GA, editors. Nuclear cardiology: state of the art and future directions. St. Louis: Mosby; 1993. p. 216-224. Kapur A, Latus KA, Davies G, Dhawan RT, Eastick S, Jarritt PH, Roussakis G, Young MC, Anagnostopoulos C, Bomanji J, Costa DC, Pennell DJ, Prvulovich EM, Ell PJ, Underwood SR. A comparison of three radionuclide myocardial perfusion tracers in clinical practice: the ROBUST study. Eur J Nucl Med 2002; 29:1608-1616. Burak Z, Ersoy Ö, Moretti JL, Erinç R, Özcan Z, Dirlik A, Sabah D, Basdemir G. The role of 99mTc-MIBI scintigraphy in the assessment of MDR1 overexpresion in patients with musculoskeletal sarcomas: comparison with therapy response. Eur J Nucl Med 2001; 28:1341-1350. Schömaker K, Schicha H. Use of myocardial imaging agents for tumour diagnosis – a success story? Eur J Nucl Med 2000; 27:1845-1863. Arbab AS, Koizumi K, Toyama K, Arai T, Araki T. Effects of ion channel modulators in the influx and efflux of Tc-99m-MIBI. Ann Nucl Med 1999; 13:27-32. Piwnica-Worms DP, Kronauge JF, LeFurgey A, Backus M, Hockett D, Ingram P, Lieberman M, Holman BL, Jones AG, Davison A. Mitochondrial localization and characterization of 99Tc-SESTAMIBI in heart cells by electron probe X-ray microanalysis and 99Tc-NMR spectroscopy. Magn Reson Imaging 1994; 12:641-652. Piwnica-Worms DP, Kronauge JF, Chiu ML. Uptake and retention of hexakis (2-methoxyisobutylisonitrile) technetium (I) in cultured chick myocardial cells. Mitochondrial and plasma membrane potential dependence. Circulation 1990; 82:1826-1838. Sayman HB, Urgancioglu I. Muscle perfusion with technetium-MIBI in lower extremity peripheral arterial diseases. J Nucl Med 1991; 32:1700-1703. Wann LS, Hellman C, Dorros G. Evaluation of leg perfusion during exercise using technetium 99m sestamibi. A new test for peripheral vascular disease. Echocardiography 1992; 9:547-552. Miles KA, Barber RW, Wraight EP, Cooper M, Appleton DS. Leg muscle scintigraphy with 99mTc-MIBI in the assessment of peripheral vascular (arterial) disease. Nucl Med Commun 1992; 13:593-603. Bostrom PA, Diemer H, Leide S, Lilja B, Bergqvist D. 99mTc-sestamibi uptake in the leg muscles and in the myocardium in patients with intermittent claudication. Angiology 1993; 44:971-976. Bajnok L, Kozlovsky B, Varga J, Antalffy J, Olvaszto S, Fulop T. Technetium- 99m sestamibi scintigraphy for the assessment of lower extremity ischaemia in peripheral arterial disease. Eur J Nucl Med 1994; 21:1326-1332. Celen YZ, Zincirkeser S, Akdemir I, Yilmaz M. Investigation of perfusion reserve using 99mTc-MIBI in the lower limbs of diabetic patients. Nucl Med Commun 2000; 21:817-822. Edwards PD, Miles KA, Owens SJ, Kemp PM, Jenner JR. A new noninvasive test for the detection of compartment syndromes. Nucl Med Commun 1999; 20:215-218. Sarikaya A, Sen S, Çermik TF, Birtane M, Berkarda _. Evaluation of skeletal muscle metabolism and response to erythropoietin treatment in patients with chronic renal failure using 99mTc-sestamibi leg scintigraphy. Nucl Med Commun 2000; 21:83-87. Lupatelli G, Palumbo B, Sinzinger H. Statin induced myopathy does not show up in MIBI scintigraphy. Nucl Med Commun 2001; 22:575- 578. Banci M, Rinaldi E, Ierardi M, Tiberio NS, Boccabella GL, Barbieri C, Scopinaro F, Morelli S, DeSantis M. 99mTc SESTAMIBI scintigraphic evaluation of skeletal muscle disease in patients with systemic sclerosis: diagnostic reliability and comparison with cardiac function and perfusion. Angiology 1998; 49:641-648. Scopinaro F, Manni C, Miccheli A, Massa R, De Vicentis G, Schillaci O, Ierardi M, Danieli R, Banci M, Iorio F. Muscular uptake of Tc-99m MIBI and Tl-201 in Duchenne muscular dystrophy. Clin Nucl Med 1996; 21:792-796. Chang YY, Lan MY, Wu HS, Huang SH, Chen SS, Liu JS. Decreased muscular radionuclide uptake in Tc-99m MIBI scintigraphy during paralytic phase of thyrotoxic periodic paralysis. Clin Nucl Med 2008;33:297-298. Cittanti C, Colamussi P, Giganti M, Orlandi C, Uccelli L, Manfrini S, Azzena G, Piffanelli A. Technetium-99m sestamibi leg scintigraphy for non-invasive assessment of propionyl-L-carnitine induced changes in skeletal muscle metabolism. Eur J Nucl Med 1997; 24:762-766. Pekindil Y, Sarikaya A, Birtane M, Pekindil G, Salan A. 99mTc-sestamibi muscle scintigraphy to assess the response to neuromuscular electrical stimulation of normal quadriceps femoris muscle. Ann Nucl Med 2001; 15:397-401. Muxi A, Magriña J, Pavia J. Myocardial perfusion SPECT. Technical aspects. In: Martin-Comin J, Castell J, Muxi A, editors. Why should you ask for a myocardial perfusion SPECT? Barcelona: Masson, 2002. p. 6-14. Chandra R. Introductory physics of nuclear medicine. Philadelphia: Lea & Febiger, 1992. Netter FH. Atlas of human anatomy. Summit: Ciba, 1996. Plas F, Viel E, Blanc Y. La marche humaine: kinésiologie dynamique, biomécanique et fatherland. Paris: Masson, 1989. Ikawa M, Kawai Y, Arakawa K, Tsuchida T, Miyamori I, Kuriyama M, Tanaka M, Yoneda M. Evaluation of respiratory chain failure in mitochondrial cardiomyopathy by assessments of 99mTc-MIBI washout and 123I-BMIPP/99mTc-MIBI mismatch. Mitochondrion 2007; 7: 164-170. 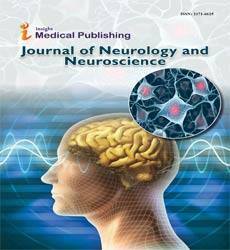 Matsuo S, Nakajima K, Kinuya S, Sato Y, Matsumoto N, Horie M, Cardiac scintigraphic findings of mitochondrial myopathy, encephalopathy, lactic acidosis and stroke-like episodes: A case report. Exp Cli Cardiol 2008; 13: 93-95. Yajima N, Yazaki Y, Yoshida K, Sano K, Takahashi W, Sasaki Y, Ikeda U. A case of mitochondrial cardiomyopathy with pericardial effusion evaluated by (99m)Tc-MIBI myocardial scintigraphy. J Nucl Cardiol 2009; 16: 989-994. Iemitsu M, Itoh M, Fujimoto T, Tashiro M, Nagatomi R, Ohmori H, Ishii K. Whole-body energy mapping under physical exercise using positron emission tomography. Med Sci Sports Exerc 2000; 32:2067-2070. Vanderthommen M, Depresseux JC, Dauchat L, Degueldre C, Croisier JL, Crielaard JM. Spatial distribution of blood flow in electrically stimulated human muscle: a positron emission tomography study. Muscle Nerve 2000; 23:482-489. Pappas GP, Olcott EW, Dracle JE. Imaging of skeletal muscle function using 18FDG PET: force production, activation, and metabolism. J Appl Physiol 2001; 90:329-337. Fujimoto T, Kemppainen J, Kalliokoski KK, Nuutila P, Ito M, Knuuti J. Skeletal muscle glucose uptake response to exercise in trained and untrained men. Med Sci Sports Exerc 2003; 35:777-783. Oi N, Iwaya T, Itoh M, Yamaguchi K, Tobimatsu Y, Fujimoto T. FDGPET imaging of lower extremity muscular activity during level walking. J Orthop Sci 2003; 8:55-61.